Include Object Shadows in an Experience . 1. From a mobile project with a 3D model, navigate to the 3D canvas. 2. Select the 3D Container widget in the PROJECT pane. Select the Cast Object Shadows checkbox in the DETAILS pane. 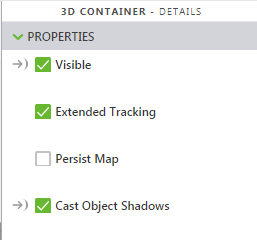 For more information about the Cast Object Shadows property, see 3D Container.